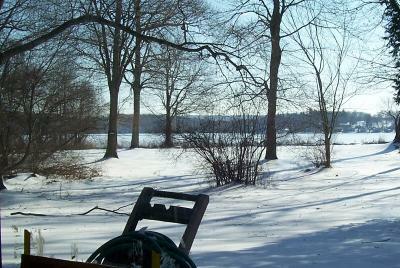 I love the lead-in of this path overlooking the pond on the Open Land Foundation property in North Salem, New York. It’s a scene that begs to be painted. This beautiful property on the south side of Baxter Road was saved from development by the horse-lovers in the area. It is now a favorite local spot for horseback riders, dog walkers, and sometimes painters! You can click here to see the thread with all the entries from the different artists who are participating. I’ve been sketching items from the list over the past few days, in between paintings. Items are numbered in the order in which they are done, not the order in which they appear on the list. So far I’ve sketched 16 of them. 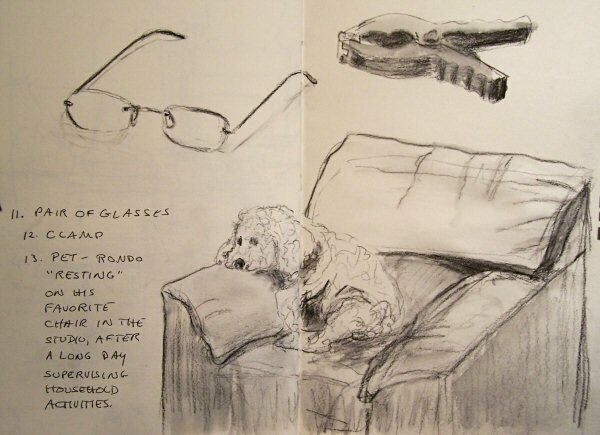 The first five items, above, are all sketched with an umber Prismacolor wax-based pencil. Watercolor washes were then applied over the top. 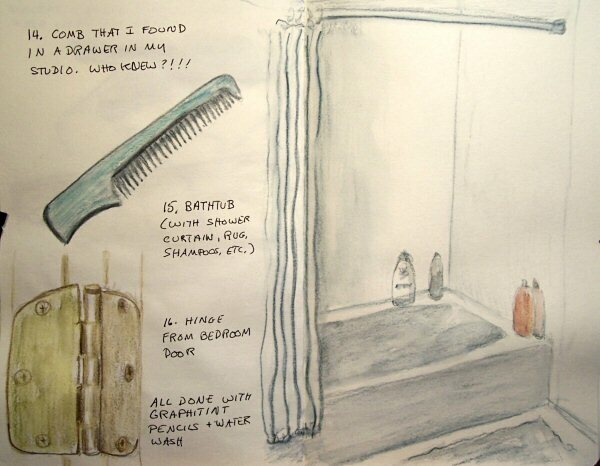 All the sketches are done across two-page spreads in my Hand Book Journal, so they measure about 8×10″. 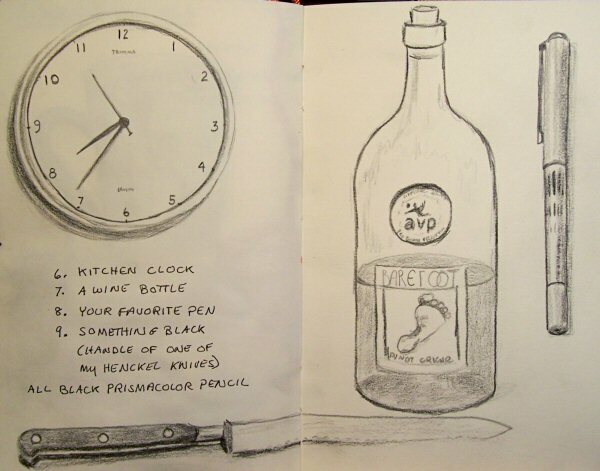 Items 6-9, above, are all black Prismacolor pencil. 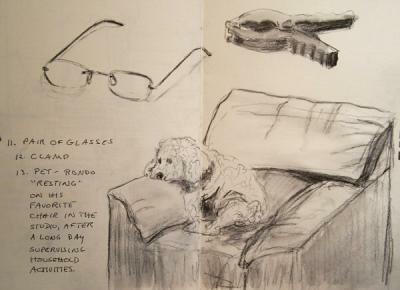 Next, I pulled out a Wolff’s Carbon pencil to do the sketches below. 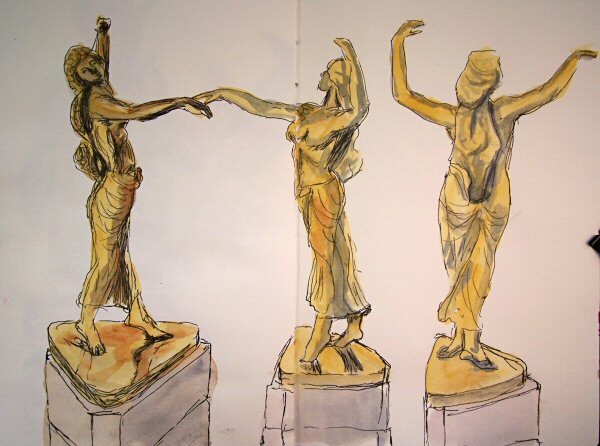 Then I used a brush with plain water to blend and shade the sketches. Now I’m coming down the home stretch. I love using these scavenger hunts to play with different mediums. 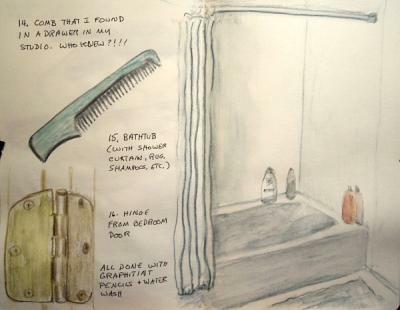 I pulled out some Derwent Graphitint pencils for the next ones. 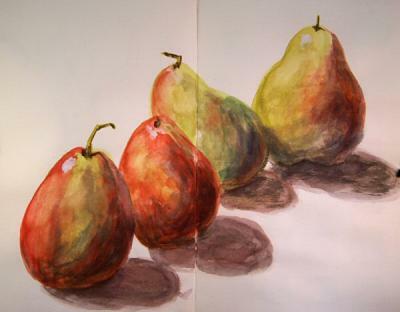 These are graphite pencils blended with watercolor. 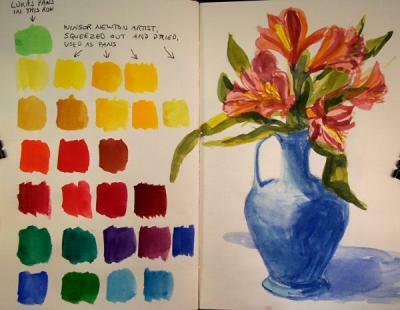 After sketching with them, the color can be blended with a wet brush. This Scavenger Hunt ends in two days, so hopefully I’ll have time to finish off the remaining items before the next one begins. It’s a great way to stay in sketching practice and explore all kinds of subjects. I bought these flowers in anticipation of a rainy day. 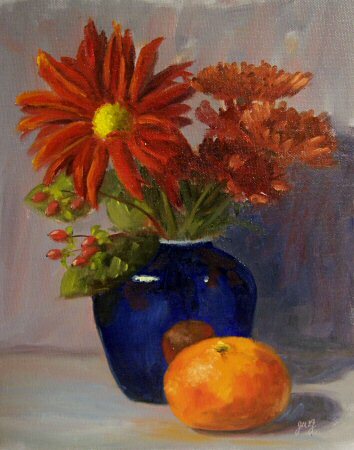 I had an especially good time with all the reds and oranges on my palette! Spending so much time sketching with watercolors in my sketchbook lately put me in the mood to do something sketchy in oils too. I really enjoyed painting these flowers that my husband gave me. It felt great to break loose from a more confining size and style and paint something with more expressive brushwork. I think I’ll do more of these! Art Spectrum Colourfix is an archival surface for all media, but is generally used for pastels. I love the way it took the oil paint! I’ve used it for both pastels and acrylics, but this was the first time I tried it with oils. I’ll definitely be working on this surface a lot more! There’s a lot of thick paint texture on the painting that, unfortunately, didn’t come through on the photo. I think I’ll have to switch to taking my photos with the Nikon and tripod, instead of hand-holding my little point-and-shoot! 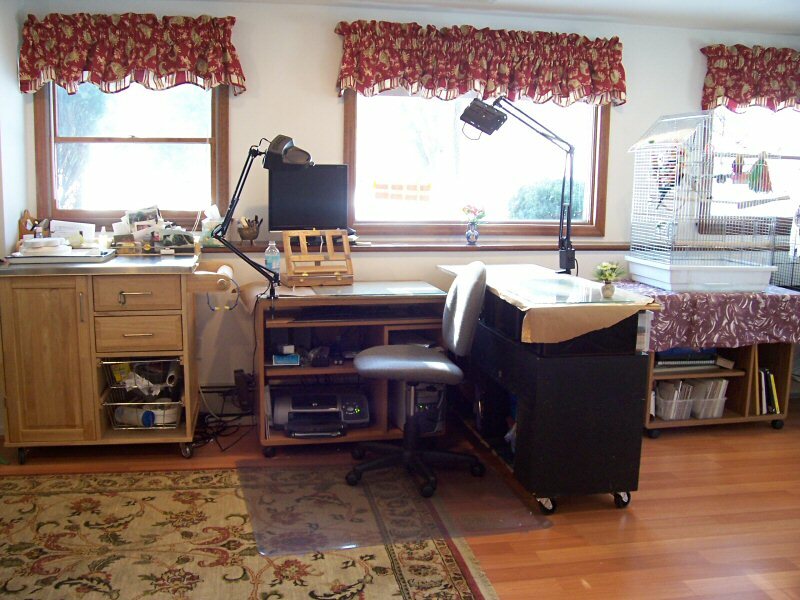 To see my studio tour, scroll down below this post! 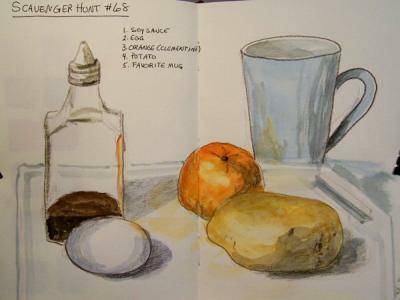 The following are watercolor sketches done while sick over the past few days. 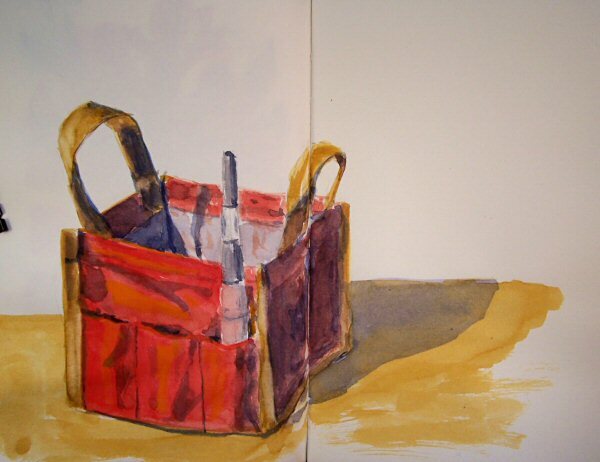 They are about 8×10″ across two-page spreads in my bound Hand Book Journal—a wonderful heavyweight paper sketchbook. Pears on Parade—I really like the composition of this one. 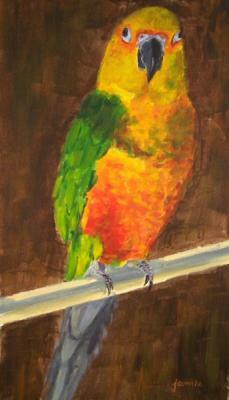 I think I’ll do something similar in a larger format soon, in oils or acrylics. Welcome to My Studio! Come in for a tour….. Welcome to my studio! Today I’m having a virtual studio tour for all of you who have wondered what my studio looks like. As many of you know, I am a plein air painter, so I only spend the coldest part of the year in here, and days with inclement weather. Still, I do many of my largest, smallest, and most important works here in the studio. 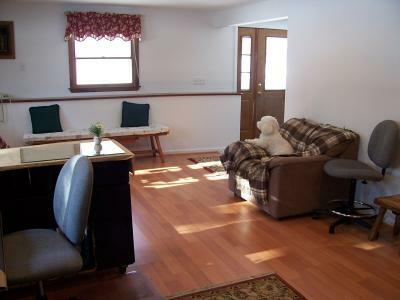 It’s also a place where friends and buyers can come visit. So, come on in! The photo above shows my main work area with my little furry mascot, Rondo. That’s Rondo’s favorite chair, though he is willing to share with visitors. Below is a photo of what you see when you come in the door from the outside. I have three parrots in here, and two more upstairs. They give Rondo plenty of competition for attention. Since this is where I spend most of my time when I’m in the house, I really enjoy having the pets here with me. 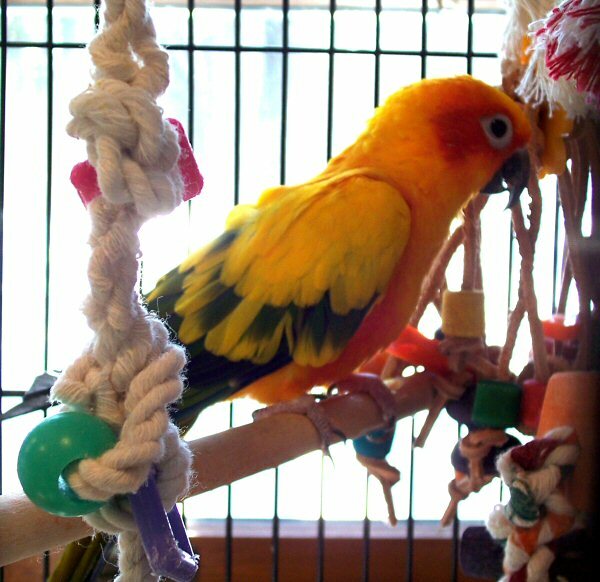 Cookie, the Sun Conure, is the sweetest bird in the house. She’s very camera shy though. She’s about 10 years old, so has passed the stage of adolescent antics! 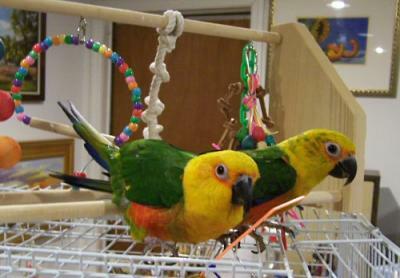 Lulu and Lucy, the Jenday Conures, are affectionately referred to collectively as Double Trouble. If there is a way to get into mischief, they will find it. This is where I do 90% of my studio work. 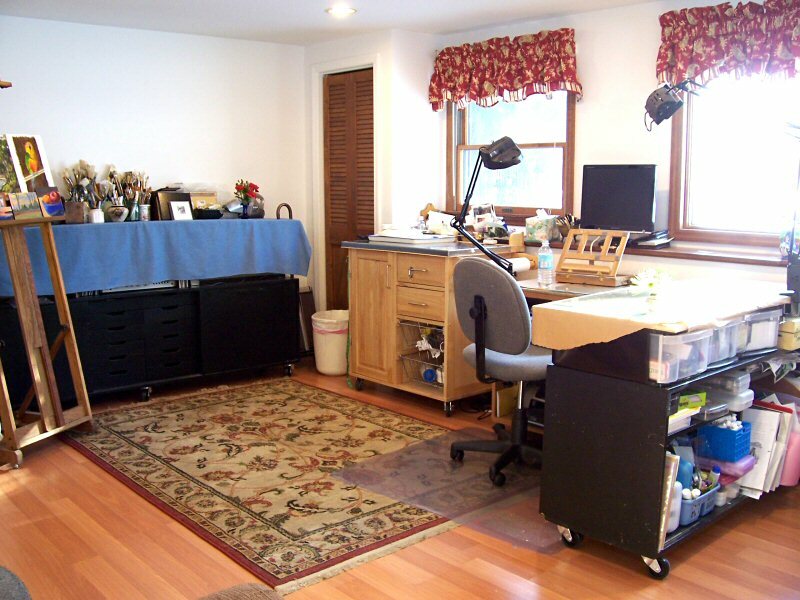 The large black cabinets hold most of what I need in the studio for oil and acrylic painting, and pastel work. Artists always ask about these large, black cabinets. They have a long history and were built around 45 years ago for a completely different purpose. The drawers have fallen off the near cabinet. My husband helped me remove the legs and put wheels on both of them, so they are easy to move around the studio to reconfigure the space as needed. Because I needed a higher work surface, I bought a bunch of plastic drawers at Staples and put them on top of the smaller black cabinet. 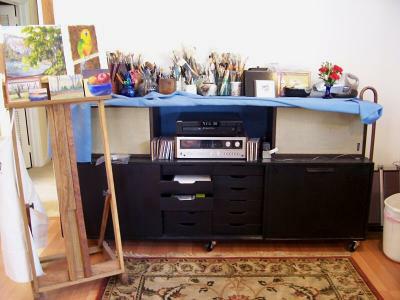 Those drawers hold paint containers, palette cups, and assorted tapes and tools. Over that is a sheet of plywood, which is covered with brown craft paper. I take notes on the paper and spill paint all over it, then just replace it when there’s no more scribble room! I had a local glass place cut two, 16×24″ sheets of 1/4″ glass and grind the edges. 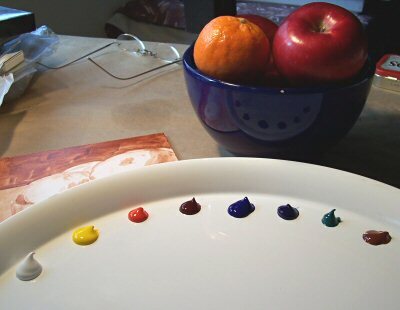 Those serve as my palettes when working in the studio. You can see one of them on top of the cabinet above. The other black cabinet has music drawers that are now used for storing smaller paper, pads, labels and drawings. By lying my two large speakers on their sides, I was able to put a large piece of plywood across the top to form another high work surface. I keep my brushes, pens, scissors, and other assorted supplies that require easy access here. I keep it covered with the cloth because it’s a little unsightly! As you can see, I have a small easel just below my computer screen, and another glass palette there as well. If I have to work from a photo, I paint directly off the screen, rather than printing out an image. The color is always better from the monitor than from a print. When I need to work larger, I prefer to stand at the large easel that you see in some of the other photos here. The lamp clamped onto my computer table also has a magnifier built into the top, which comes in very handy for my miniatures. The other lamp, clamped to the black cabinet on the right, is often used to light a still life on top of that cabinet, or for extra light on my work as needed. I have recessed ceiling lighting in the studio, and use flourescent floodlights in the high hats. 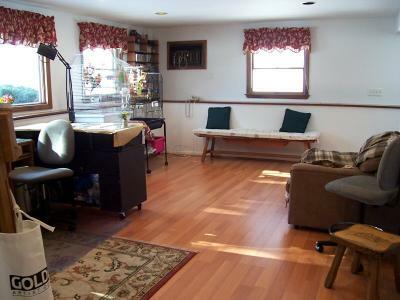 There is a long bench for extra seating over on the other side of the studio. I don’t have a crowd in here too often, and before a show, that bench gets cluttered with frames and paintings on their way out the door. 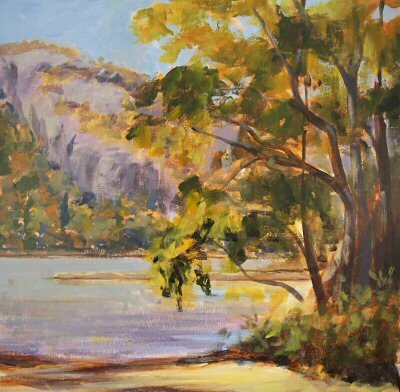 The view up the hill to the road is one I paint from time to time as well. 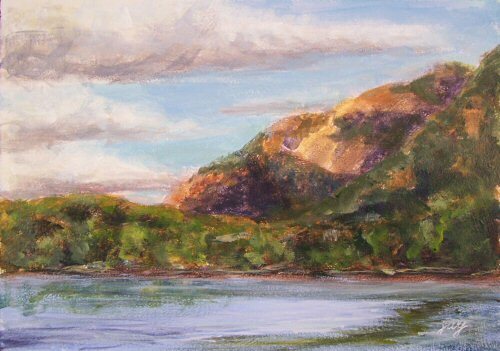 In fact, I’ve painted this view twice in the past few weeks! In case you’re wondering what’s taped to the window, that’s actually a lightfastness test, to see how quickly certain pigments will fade when exposed to direct sunlight. I’m testing alizarin crimson and some of the supposedly “lightfast/permanent” versions of alizarin, by many different paint manufacturers. 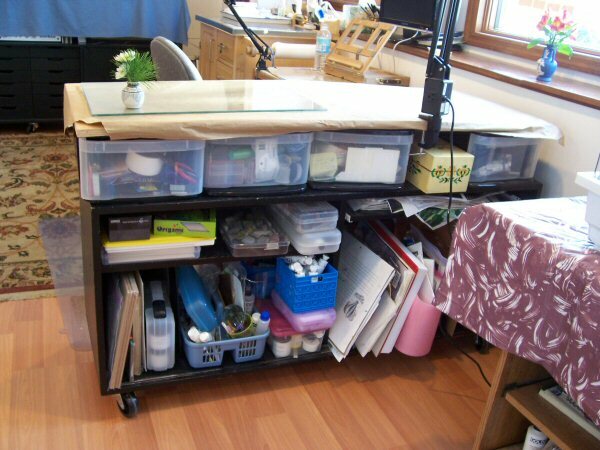 Artists often ask me how I can keep my studio space so tidy and organized. The truth is, my studio used to be an absolute mess. In the past six months, I’ve taken everything out of my studio that I possibly could, leaving the space here only for current work and what I need to do that. I no longer use my studio for storage of paintings, frames, or large paper and canvases. I’ve even taken the paintings off the walls in here to help keep my mind clear. 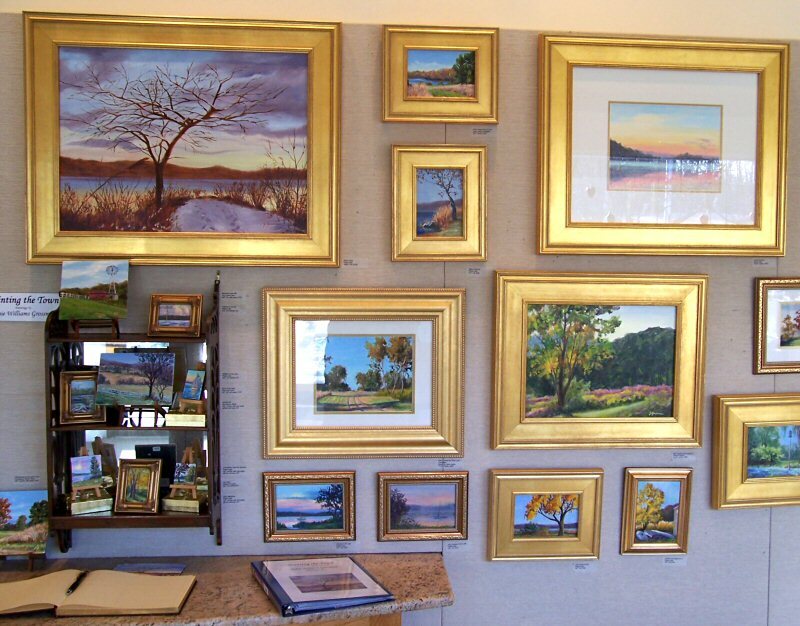 Stored paintings are now in crates in an adjacent room and double-hung on walls. Most of my extra tubes of oil paints have gone to a large shelving unit in the adjacent garage. Frames and framing supplies are now taking up residence in the workshop instead of the studio. 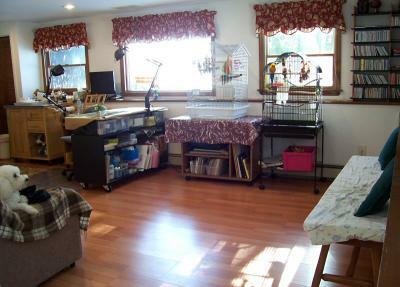 Colored pencils, watercolor pencils, and watercolors are upstairs in another little studio/den with my other two parrots. (I’ll have to do a separate tour of that one another day—there are some very interesting things up in that one, including my mini museum of artwork I’ve collected.) 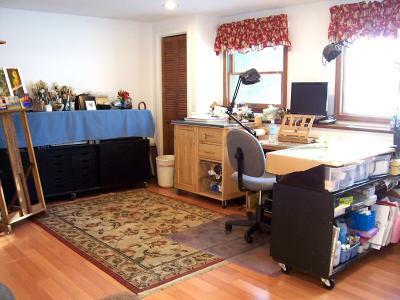 It’s not easy to keep this space clutter-free. Only by keeping what’s in here to the bare minimum have I been able to finally gain control over the chaos! 1. Mobility of furniture. With everything on wheels, I can have a completely different studio setup in a matter of minutes. How often do I need to do that? A lot. 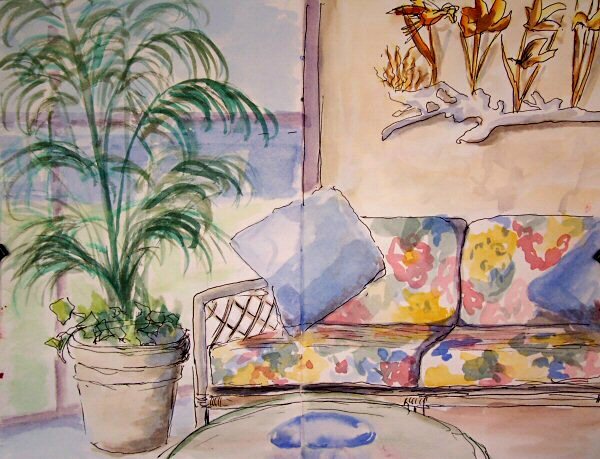 If I have a model in, or work in pastels, or work on a very large painting, the setup is entirely different than what you’ve seen on this tour! 3. Great light. You can’t paint without it. 4. Great music! It makes the world go round, and increases my patience tenfold when the going gets tough on a painting! 5. A spot for a still life setup and/or model. There’s nothing like working from life, whether out on location or in the studio. Photos are poor substitutes for the real thing. In case you thought you’d never be able to find your way out of here, the door’s right over there! Thanks so much for coming to visit my studio. I hope you enjoyed the tour! If you’re not too tired and want more, check out the Daily Painter’s site on 12/19/07, when many of the other Daily Painters will be hosting virtual studio tours! I do bring them down here to the studio from time to time, but fearless Mango invariably flies over to the Conures, who probably wouldn’t think twice about biting his little feet off when he lands on their cage. Even with their wings clipped, birds can fly enough to get around the room. 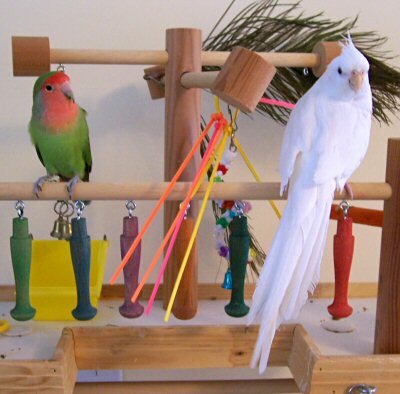 So, it’s for his own protection, and Coconut’s, that the smaller birdies live upstairs. 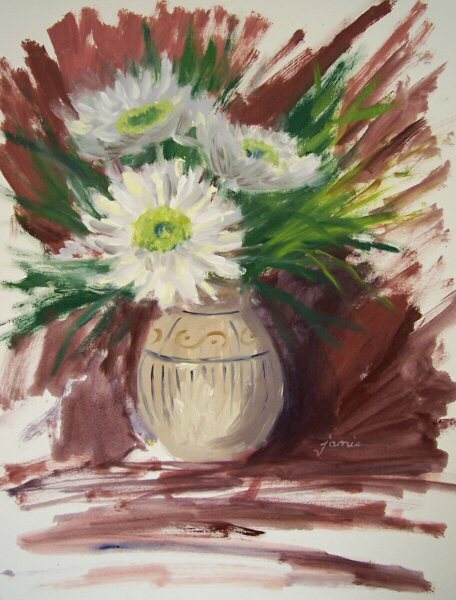 Email me at JamieWG@aol.com if you are interested in this painting. I had picked up a few long/tall format frames, and they turned out to be perfect for this painting of Lulu, so this painting is available framed! 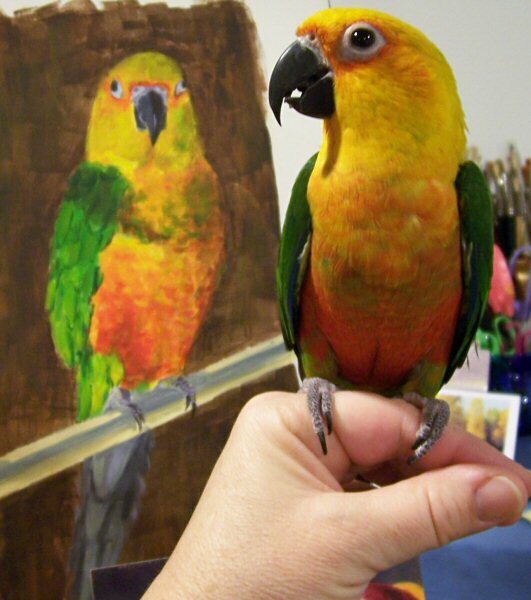 I couldn’t resist showing Lulu her portrait. She thinks it makes her appear too sophisticated. I think I’ll have to do another with her doing some of her usual bratty antics! 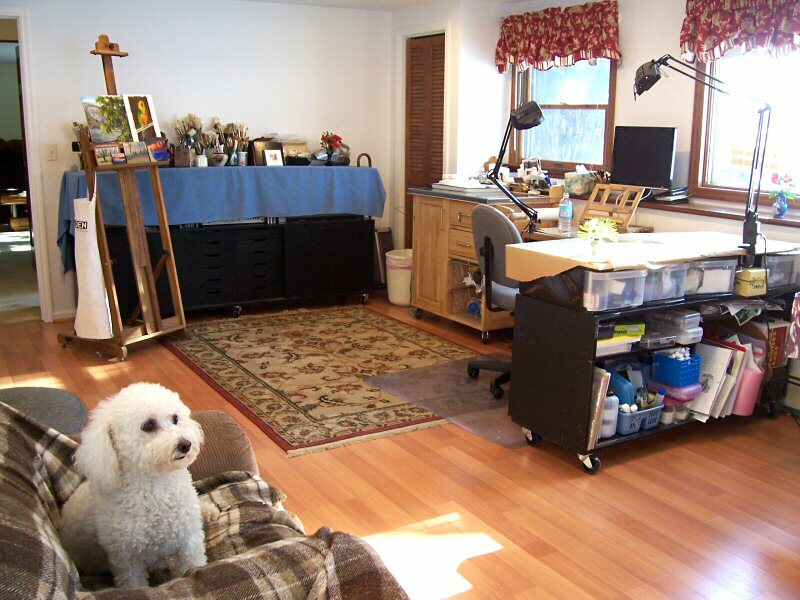 Be sure to come back and visit tomorrow, when I’ll be posting an online tour of my studio! 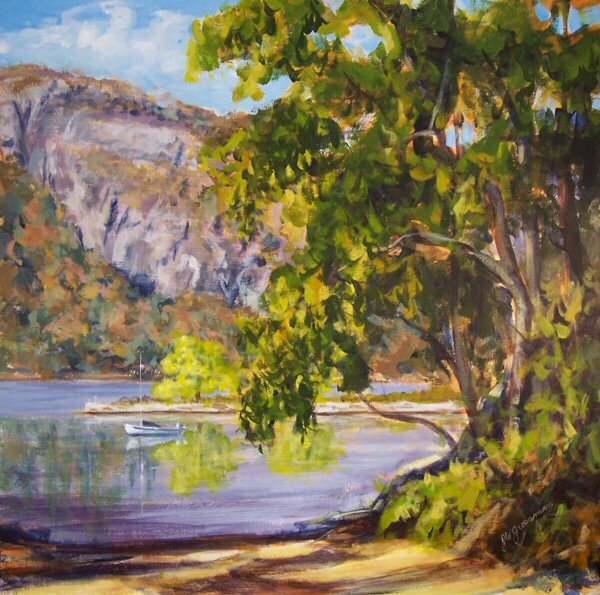 Since I’m still sick, I am bumping up a painting of one of my favorite trees along the Hudson River to share with my viewers. It’s become hidden in the depths of my blog, so I’m happy to pull it up to the top again where it can be seen. I did some sketches today, but don’t have the energy to get into the workshop to take pictures of them and do the uploading. 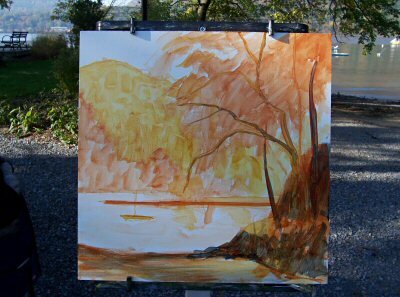 This was painted on a warm, sunny fall day. 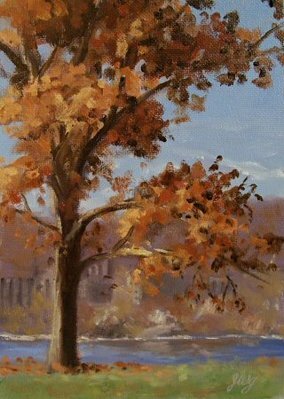 I took advantage of it by driving over to Garrison and painting my favorite tree along the Hudson River. It is just opposite West Point Military Academy. Fortunately for me, the tree still had leaves, though it was already November! This painting is already dry and varnished, so it’s ready to send and would make a great gift! 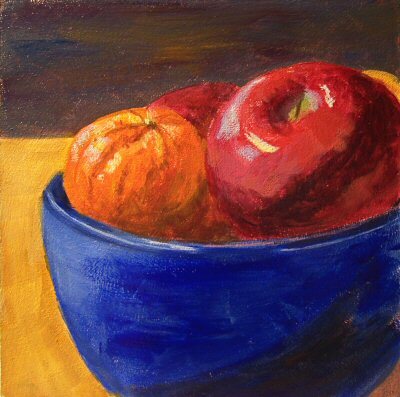 Today I pulled out my acrylics to finish up this still life that I started last week. 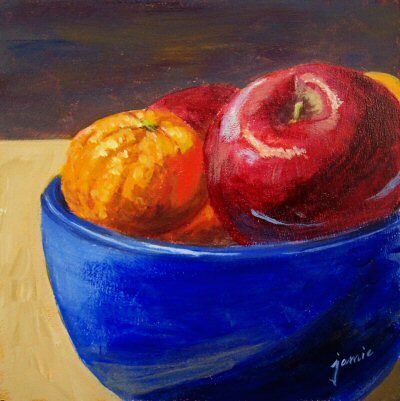 When I left for Florida, I put the bowl of fruit into the refrigerator with a sign on it saying, “Jamie’s Still Life—DO NOT EAT!” I suppose they got the message, because it was still there today. I think I’ll have a clementine now! 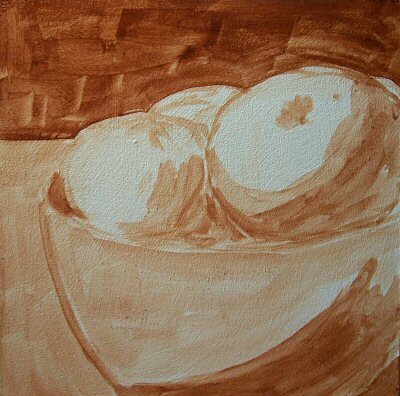 First I drew in my composition with acrylic burnt sienna paint, and blocked in some values. I don’t spend too much time on this stage—just enough to kill some of the white support, add a little complexity to the color, and give myself a road map for local color and values. I started with the shadow areas, and worked until the support was covered with the local colors. To finish, I pushed lights and darks, and added in some details, highlights, and reflected color. You may click images to see larger views. My parents have this beautiful bronze statue of a dancer in their home. 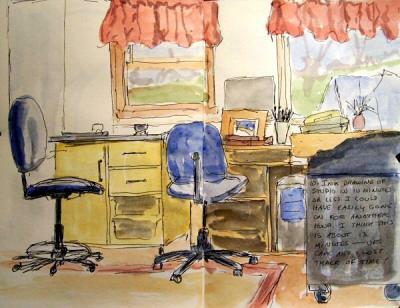 I’ve always wanted to paint it, and enjoyed sketching her from many different angles in ink and watercolor. 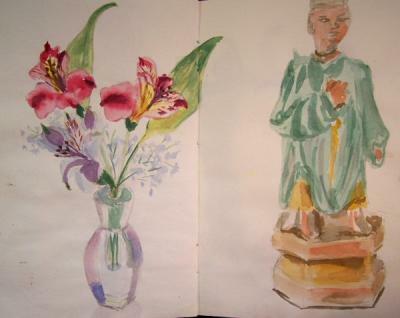 The flowers below were sketched out on the lanai, and the chinese figure is from a set of three, but I only had time to start one, and didn’t get to finish it. These are all on two-page spreads in my sketchbook. I just returned from a couple of days of visiting my parents in Naples, Florida. They’ve got a wonderful lanai overlooking the Gulf of Mexico, so I did a couple of watercolor sketches out there. Above is a section of their seating area, and below is a quick sketch of the view of the Gulf from the lanai. Both are watercolor, 8×10″ across a two page spread in my sketchbook. If you like my website design….. The designer of my website/blog is now offering this software via his company, Digital Sublimity! I’ve been so happy with the way it works, so I hope some of you who appreciate the functions that I have here will go check it out. One of the pitfalls to a blog is that it doesn’t allow for static pages to view large groups of work as thumbnail images, like a webpage does. However, this site was designed to give me that capability of a website, while maintaining the easy functionality and updating potential of a blog. 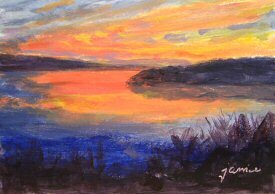 Paintings come and go automatically on the “Available” page as I paint, post and sell works. In addition, the “ArtPal” feature of the blog enables artists to easily put Paypal buttons into their posts wherever they wish. On those posts, the button is automatically converted to “Sold!” when somebody pays for a painting, so you never have to worry about double-selling a piece. It then removes the painting from the list of Available works, and places it in the “Sold” category. I’d encourage those who have been considering a blog/website, or who have been unhappy with the features they currently have available, to get in touch with Digital Sublimity, and see what they can work out for you. As they say there, they do “more than you think for less than you think”! 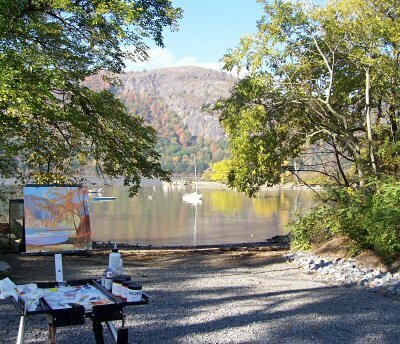 My painting buddy, Suhua Wood, found this amazing spot along the Hudson River in Cold Spring for us to paint! 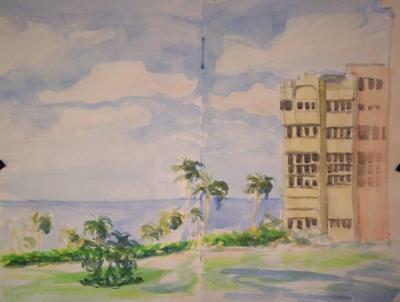 I started this painting on location a few weeks ago, but didn’t have enough time to finish it there. I finally finished it up from a photo. I took pictures of the various stages as I painted. First I underpainted with Golden Fluid Acrylics, using Transparent Red Oxide for all but the lightest areas. Some light areas then got a wash of Transparent Yellow Oxide, and cool darks got some Ultramarine Blue. I pulled out some heavier bodied acrylics, and laid in the sky and water. You can see an image of my scene and setup here as I was working. Then I started working with the local colors I saw. The image below shows how much I completed on location, and how far I still had to go. I used a photo of the scene to finish up the painting, in combination with the information already there from having worked on location. 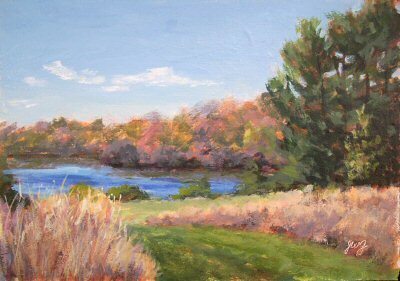 Being able to do even a portion of the piece en plein air always makes a difference in the outcome. 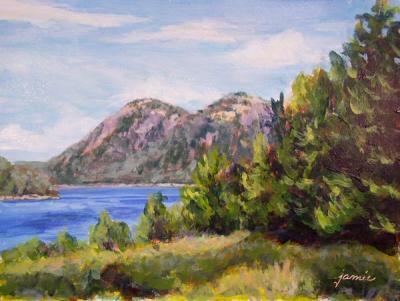 When I received word today that this painting had sold in a gallery, I went looking on my website and couldn’t find it! Sometimes I just forget to post my work, and this one never made it onto my site. This painting was done in late September and went straight to the Bannerman Island Gallery. 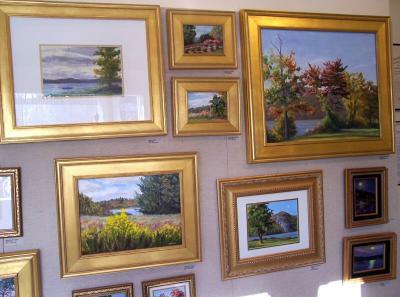 Many thanks to everybody who came to the opening reception of my solo show at the North Salem Library! 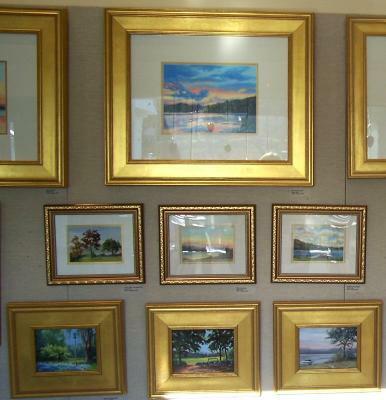 I tried to snap a few pictures of some of the paintings before things got busy. As you can see, it’s a good thing I’m a painter and not a photographer! 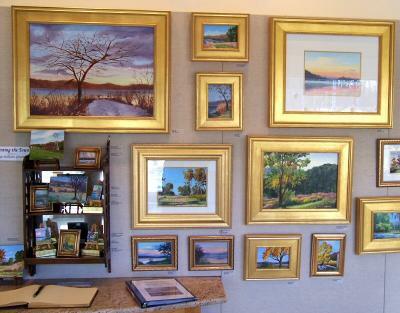 My daughter Sarah had the job of arranging the little shelf of small works. She has such a good eye. 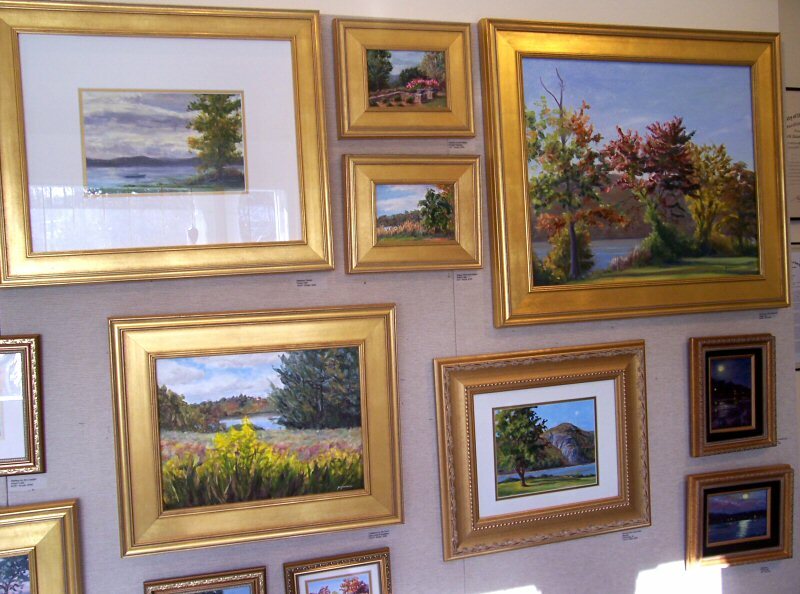 I challenged visitors to pick out which ones were oils and which were acrylics, but the painting above on the right, in the middle row, with the dark hillside, pink grasses with goldenrod and backlit tree fooled nearly everybody. 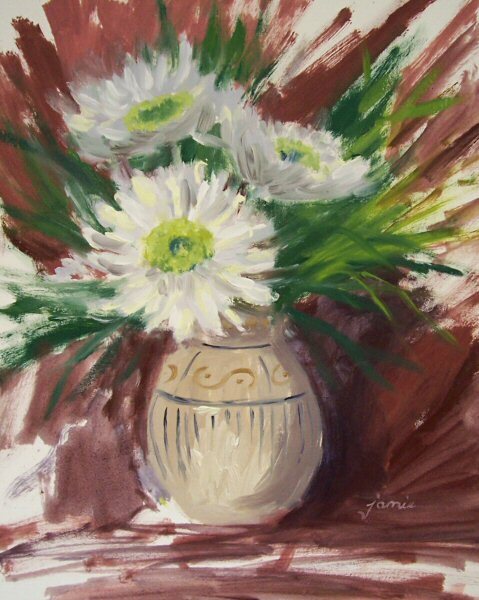 The light streaming in from the window caused a lot of glare to the paintings framed under glass, but you can get an idea…..They’re all on the site here in their own individual posts, unframed, if you want to see better images of specific works. 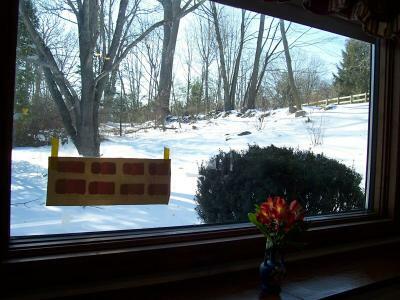 Clearly there are advantages and disadvantages to framing under glass! They didn’t show as much glare in real life as they’re showing in the photos. The Farthest to Travel Award goes to Seth Golden of Golden Acrylics, and his mom, who drove all the way down from Oneonta, New York for the opening. That was a huge and wonderful surprise to me! I really appreciate all my friends and neighbors who came from near and far, enjoyed the show, and provided great laughs, support, and companionship. Thank you also to the staff of the North Salem Library who made the show possible, and the library board members who visited. For those who couldn’t come to the opening reception, the show will run through the end of December during regular library hours.